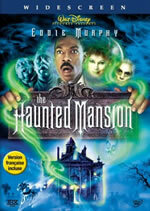 After stellar so-called "kiddie flicks" like Elf and Finding Nemo - movies designed to appeal to the whole family - comes The Haunted Mansion, a terminally lame comedy based on a Disneyland ride. Filled with impressive special effects and larger-than-life set design, The Haunted Mansion certainly doesn't disappoint on a visual level. But screenwriter David Berenbaum (who also wrote Elf; go figure) doesn't bother to give us a single character worth caring about. As expected, Murphy coasts on his ample charisma, while co-stars like Terence Stamp and Wallace Shawn receive too little screentime to make any kind of impact. After pummeling us with computer generated images for close to 90 minutes, the film presents us with a conclusion that's meant to be heart-warming (it's not; we're just glad the movie's finally going to end). Audio: The Haunted Mansion comes equipped with a very impressive Dolby Digital 5.1 soundtrack, which is ideal for showing off a home theater setup. There’s certainly a you-are-there quality to this track. Video: Ditto this anamorphically enhanced 2.35:1 transfer, which is bright and clear – not terribly surprising, given how new the movie is. You’d be hard-pressed to find any complaints regarding this transfer. Extras: This Disney DVD actually contains a surprising amount of extras, the majority of which should please fans of the film. The disc includes two commentary tracks – one featuring director Rob Minkoff and costime designer Mona May, with the other featuring screenwriter Daniel Berenbaum, visual effects supervisor Jay Redd, and Don Hahn – which really should have been combined into one. Though both tracks are informative, there’s only so much conversation about The Haunted Mansion one person can take (again, this is something that will appeal to those who enjoyed the movie). Next up is a 12-minute featurette called The Haunted Mansion: Secrets Revealed. As the title indicates, this is a look at how the various special effects were accomplished – from the graveyard zombies to that spinning chair Murphy’s character sits in – with interviews from some behind-the-scenes folks, including noted makeup maestro Rick Baker. Next is the 11-minute Anatomy of a Scene: Ghosts in the Graveyard. This is an involved look at how a relatively short sequence was accomplished, using a combination of intricate makeup and costuming along with computer effects. Informative, but not entirely interesting. For the kiddies, the disc includes a tour of the Haunted Mansion, with two of the film’s ghosts acting as guides (one of whom is Wallace Shawn, a very long way from My Dinner with Andre). Rounding out the disc’s bonus features are a short deleted scene, a five-minute outtake reel, a music video by Raven, and several Disney Sneak Peeks (for Aladdin: Special Edition, Ella Enchanted, The Incredibles, Ghosts of the Abyss, The Haunted Mansion video game, W.i.t.c.h., My Wife & Kids, and Tower of Terror). Conclusion: Kids will probably enjoy The Haunted Mansion, though it’s certainly too scary for little ones. Everyone else would be well advised to stay away.